A POD with the best sounds yet, plus the practicality to use them in any situation. Detailed and playable HD amp models. Huge range of effects. Flexible connectivity. Stage-ready build quality. Less USB audio routing flexibility than the PODx3 and x3 Live. Some larger combinations of amps and effects not possible due to DSP limit. The new HD PODs have a rugged, stage-ready build quality. In terms of realism and sound, the amps are really on the ball. The built-in display allows preset editing, but it's far easier to plug into a computer. The various connections are conveniently located at the rear of the unit. The Line 6 POD range, starting with the original kidney bean-shaped tabletop unit and moving through various incarnations including rack-mounted and floorpedal versions, has been the go-to resource of many guitarists wanting a varied palette of modelled amp and effects sounds for recording, practice and, in some cases, live use. That looks set to continue as the new POD HD series takes the whole shebang to a new level by introducing High Definition modelling. High Definition modelling has been in development for the last few years, after Line 6 realised it had taken its existing modelling technology as far as it could. ""The HD500 is well built, with a rugged metal chassis, pedal and footswitches." Line 6 says HD offers around 10 times the processing of earlier models and recreates guitar amp sounds to a much higher level of detail than before. 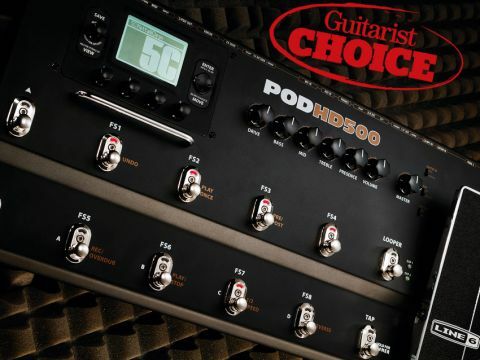 Aware that software has supplanted some of the roles played by the original POD, and that many guitarists are keen to use POD sounds live, Line 6 has presented the new PODs in rugged floorpedal form only. The three models - the HD300, HD400 and HD500 - all sound the same, give or take a few effects, but vary in the detail of their facilities (see Pick Of The PODs); the HD500 we have here is the all-encompassing flagship unit. A major difference between the new PODs and the old is that this time just 16 amps have been modelled, Line 6 says the idea here is that it's better to have 16 inspiring, articulate HD amp models in a wide tonal range instead of a large number that aren't as inspiring. To this end, the finest specimens of each amp were tracked down and restored to peak condition with the help of the top valve amp experts in LA, before their sounds were analysed, modelled and recreated. In addition to the amp models, you also get M-Class effects as found in the M9 and M13 stompbox modellers. Besides the HD modelling, the new series has two more features not seen before in a POD, one being a full-blown looping facility and the other being the L6 Link that allows the floorpedal to be integrated with the company's new HD50 amp via a single cable. The 500HD offers 512 memory locations, 256 of which are preloaded with factory presets that can be overwritten if desired (no bad thing as some are more programmer's wet dreams than guitarist's tools!). Presets are saved in eight set lists, each having 16 banks of four presets each. Each preset offers a signal chain with eight effects blocks and the amp model, which can be placed anywhere in the signal chain. Two simultaneous rigs of amps and effects are the POD's effects models can be loaded into the effects blocks. One block can also be designated as the hardware FX loop, so you can integrate other pedals into the system. The HD500 is certainly well built, with a rugged metal chassis, treadle pedal and footswitches. It has a varied array of connections residing neatly round the back that should ensure connection in a wide variety of scenarios including - with Variax socket and L6 Link - a complete fully integrated Line 6 system of guitar, pedalboard and amp. As is the POD way, a set of knobs allow instant tweaking of the amp sounds while, for foot control, you get a treadle and 12 footswitches in two tiers of six. The two footswitches on the far left scroll up and down through the memory banks while the middle four on the lower tier select each of the four presets in the bank, the final lower tier footswitch taking care of tap tempo duties or calling up the onboard chromatic tuner. Effects in the signal chain are turned on and off by the four switches in the middle of the upper tier, but you can set the HD500 so that the four lower tier switches that would have been used to call up presets are used to switch effects - thus allowing individual switching of all the effects in the signal chain. The final footswitch on the upper tier turns the HD500 into a looper with seven of the other footswitches then taking care of various looper functions (undo, play once, pre/post, rec/overdub, play/stop, half speed, reverse), allowing you full control over what is a very performance-friendly looper. The pedal treadle can be assigned to control any parameter and is actually two expression pedals in one (EXP1 and EXP2): pressing down on the toe switches between the two so it's easy to switch from wah to volume. Alternatively, you can add a standard expression pedal to the system via a rear panel socket to take on the EXP2 role. The amps modelled this time around are a mixture of the classic amps that most players would regard as absolutely essential and some new boutique favourites that many will have heard of, but few will own, such as the Divided By 13 JRT 9/15 and the Dr Z Route 66. In terms of realism of sound, the amps are really on the ball and extremely detailed, but with HD modelling Line 6 has also been able to place more emphasis on the tactile aspects of plugging in and playing so dynamic response and feel is a definite improvement over previous versions - playing through one of these should put a smile on your face. The effects will be familiar to M13 owners and with up to eight available there's great sonic potential. There's also the option of switching off the amp sims and using the HD500 purely as a pedalboard into your amp. In fact, with the huge array of memories and the set lists, you could have presets created just for that purpose, as well as ones with the same sounds, but with amp and speaker models for headphone practice and recording. All of your editing can be carried out using the buttons, knobs and cursor surrounding the display but it takes a little getting used to and the experience is far, far easier if you connect the HD500 to a computer via USB and take advantage of the software editor/librarian that's freely downloadable from the Line 6 website. The larger coloured display and clear graphics make quick and easy work of editing sounds, assigning footswitches and generally setting up the unit in advance for live use. The USB connection also allows the HD500 to be used as a two-channel audio interface for digital recording - it doesn't have as many USB routing options as on the x3 series but it's adequate for most needs. Line 6 has included everything you are likely to need to be able to usefully integrate the HD500 into just about any onstage or studio set-up and configure it for use in several different ways, so there's a great amount of flexibility in that direction and certainly loads of versatility when it comes to creating sounds. Some might argue that only having 16 amps is a backward step, but how many amps do you really need? These particular ones have been chosen to cover a wide range of vintage and modern sounds and the fact that you can use two amps at once, combined with the huge range of effects, means you should be able to dial up something close to any electric guitar sound you're familiar with - as well as conjuring up some that you'll have never heard before. Overall the POD HD500 and its siblings are very good news for all of us - oodles of practicality and great sound for a reasonable price - no complaints here at all.